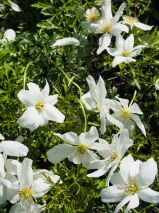 A native NZ climber with bright green leaves and starry creamy white flowers with yellow stamans throughout spring. This petite climber is magical climbing through trees, or other climbers. Plant with roots in shade.It grows into a bushy trailing or scrambling evergreen non clinging climber.